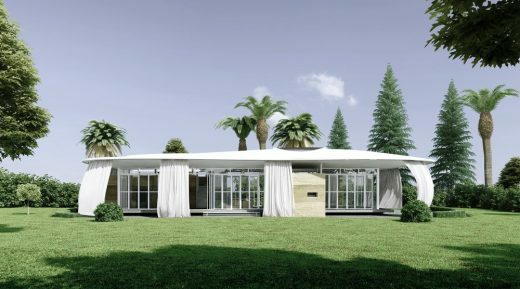 The eco-friendly design and its construction are based on Hybrid Architecture principles (high-tech/low-tech) developed and pioneered by Philippe Barrière Collective (PB+Co) in North Africa. 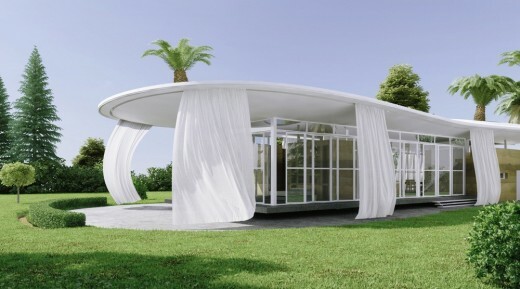 It is built with low-tech adobe walls and with a high-tech lightweight cantilevered metallic frame canopy wrapped with PTFE membrane. This hybrid Architecture brings technical innovation while using traditional craftsmen skills. 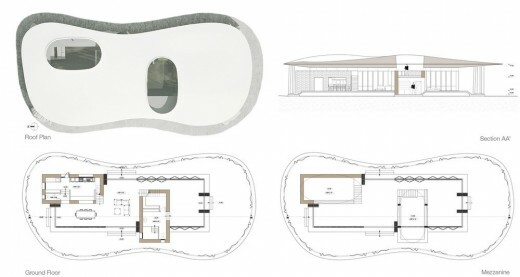 1 – Bioclimatic principles have determined the design including a shaded veranda, cross ventilations, high ceilings, multiple sun protections systems (cantilevered canopy) and passive solar energy (adobe wall thermal mass). – The veranda is conceived as a double transition zone, protected by an outside curtain and by an intermediate layer of moucharabiah. An inner layer of accordion glass doors opens the house outwards according to the various needs. – Adobe walls serve as a significant heat reservoir due to their inherent thermal properties. By hot days and cool nights (in winter), the high thermal mass of adobe mediates the high and low temperatures of the day, moderating the inside temperature. – The roof is made of three separate layers of ETFE wrapped inside and outside the structure, the spaces in between allows a constant flow of air circulation. This air cushion provides both insulation and strength. ETFE is eco-friendly (100% recyclable) and requires minimal energy for transportation and installation. 2 – Low cost construction and materials. – The ecofriendly adobe wall can be built by local masons. In addition to being low cost construction and material, earth is available nearby, requires no transportation and can easily be recycled. Expertise is available in the region both for construction, durability and maintenance. 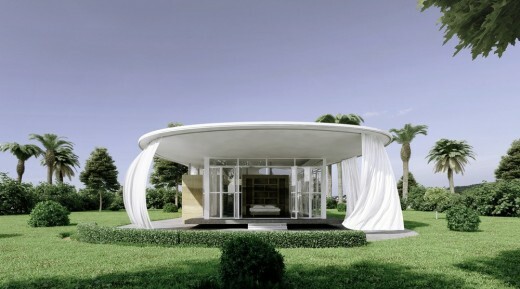 – The light roof metal structure is economical and can be executed by wrought iron local craftsmen. ETFE foil membrane rolls are inexpensive, unaffected by UV light, atmospheric pollution and other environmental weathering. – An adjustable water repellent light linen curtain protects the adobe and the veranda. Inexpensive, light and beautiful, it let air breath trough and dries easily. It can be pulled or be fixed to the floor easily by a clasp, when and where needed. Produced locally it encourages linen craft and weaving mill. Location: Near Marrakech, Oed/Hassoun, Dr/Zankara, Ain Neffad. Engineer: Hatem Jamoussi, Optima Engineers (CEO), Tunisia. Structural Engineer Roof North Africa: Tarek Ghorbel, Abid Med Nabil. Structural Engineer Roof: Dr. Takanori Yagi, Shanghai Taiyo Kogyo Co., Ltd.- Dr. Takanori Yagi, Shanghai Taiyo Kogyo Co., Ltd.
Design Team: Adnen Ben Tanfous (Associate Partner), Asma Haddouk, Samir Issad, Kaouther Moussa, Bahroun Khaoula, Abbassi Ibrahim, Mahmoud Abassi.